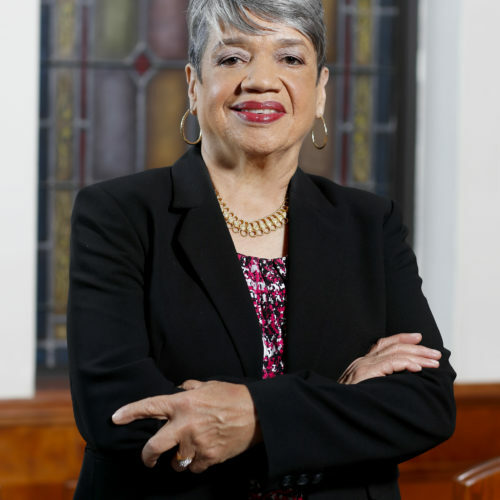 Christine Mann Darden, the youngest of five children and the daughter of an insurance agent and a teacher, is a native of Monroe, NC and a graduate of Allen High School, a United Methodist boarding school in Asheville, NC. She has a BS Degree in Mathematics Education from Hampton Institute (now University) in Hampton, VA, the MS Degree in Applied Mathematics from Virginia State College (now University) in Petersburg, VA, and the D.Sc. Degree in Mechanical Engineering from George Washington University in Washington, DC. Darden also holds a Certificate of Advanced Study in Management from Simmons College Graduate School of Management in Boston, MA. After nearly 40 years of service, Dr. Darden retired as a member of The Senior Executive Service in March 2007 from NASA Langley Research Center, where she was hired in 1967 as a Computer/Data Analyst in the Re-Entry Physics Branch. Her final assignment at Langley was as Director of the Office of Strategic Communications and Education (OSCE). In that position she was responsible for the Center’s external and internal communications, community outreach, governmental relations and educational outreach. Prior to the OSCE position, which Darden assumed in October 2004, Darden served as the Langley Assistant Director for Planning, responsible for the Langley strategic planning process, and oversight of the Center’s delivery on commitments. Darden also previously served as Director of the Aero Performing Center Program Management Office (APCPMO) where her office had oversight of NASA Langley’s work in Rotorcraft, Efficient Engine Technology, Computational Fluid Dynamics, and Air Traffic Management. She also served as a Senior Program Manager in NASA’s High Speed Research (HSR) Program Office, and for nearly 30 years as an internationally known researcher in high-speed aerodynamics and sonic boom research. NASA, in March 2018, signed a contract with Lockheed Martin for the build of a full-size supersonic low-boom x-plane to demonstrate both low-boom performance and supersonic efficiency—a continuation of the sonic boom work performed and/or led by Darden. Prior to her NASA career, Darden served as a Mathematics Instructor at Virginia State College and taught high school mathematics. Darden is a current or former member of several professional or honorary societies, including: Past National Secretary of the National Technical Association, Associate Fellow of the American Institute of Aeronautics and Astronautics (AIAA), Past Secretary of the AIAA Technical Committee on Aero-Acoustics, Beta Kappa Chi National Scientific Honor Society, Kappa Mu Epsilon Honorary Mathematics Society, Alpha Kappa Mu Honor Society, Sigma Pi Sigma Physics Society, and Kappa Delta Pi Educational Honor Society. During her NASA career, Darden authored over 57 technical papers and articles, primarily in the areas of sonic boom prediction, sonic boom minimization, and supersonic wing design. She is recognized as a international expert in these areas—having given technical presentations in Germany, England, France, Greece and Japan. Darden has been recognized with dozens of awards and honors—including two NASA Medals, one for her work and leadership of the Sonic Boom Program, and the other for her active involvement in working with and encouraging students to pursue careers in Math and Science. In addition, she received the Black Engineer of the Year Outstanding Achievement in Government Award and the Women in Science & Engineering Lifetime Achievement Award. Darden was recently included in the book, “Hidden Figures,” by author Margot Shetterly as one who stood on the shoulders of Katherine Johnson, Dorothy Vaughn, and Mary Jackson, NASA “Human” Computers” who as members of the segregated West Computers contributed to the NASA Space Program in the early 1960s and who in 2016 were featured in the Twentieth Century movie of the same name. Darden and her husband of 54 years, Walter, are the parents of 3 adult daughters, 5 grandchildren and 3 great-grandchildren. 10:30 a.m.	- 1:00 p.m.